The haier water heater has a 2mm thick steel UMC tank(Ultra micro coated) with viterous enamelling protects the tank from corrosion. Incoloy 800 stainless steel heating element with hight efficiency of 97.9 % maintains best performance under hight temperature & pressure conditions. 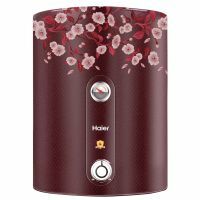 To Recieve updates and possible rewards for Haier ES15V-Color FR please sign in. To Recieve updates and possible rewards for Geyser/Water Heater please sign in.